STARTLED AT THE BIG SOUND: ESSAYS PERSONAL, LITERARY, AND CULTURAL is the first prose collection by Stephen Corey, a widely published poet (with ten collections in all) and one of the country’s most highly regarded literary editors, who cofounded The Devil’s Millhopper in 1977 and has worked with The Georgia Review since 1983. These essays, written across three decades, variously describe, analyze, and meditate upon his concurrent lives as family member, publishing writer, editor for a major literary journal, and cultural-political observer of the broader world within which he has lived while experiencing his smaller realms. 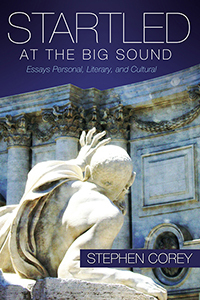 In these essays, Corey finds himself unwilling and/or unable to write about a family member without alluding to poetry or other arts, about his editing work without reference to his own writing practice and philosophy, or about his own writing without connecting it to history and society. Whether writing on being a conscientious objector during the Vietnam war, on the death of Roy Orbison, or about an adoption document that comes to America in advance of his new South Korean infant daughter, Stephen Corey finds himself moved to new definitions of his other life’s blood, poetry. As the title of one of Stephen Corey’s poetry collections states, “There is no finished world,” and many of the essays collected here speak to one or both senses of that crucial word “finished”: for the artist, there is always the urge to polish the work, to move it one word or brush stroke closer to an ever-elusive perfection; for the human being, there is always the need to argue with inevitable mortality so as to make the most of the life at hand.